DowDuPont, the chemical behemoth created in 2017 from the merger of The Dow Chemical Company and E.I. DuPont de Nemours and Company, is set to spin-off Dow Holdings (“New Dow” or DOW) on April 1. This is the first of two planned steps to create three leading global publicly-traded companies: New Dow will focus on material sciences; Corteva, which will be spun-off on June 1, on agriculture (seeds and crop protection); and the surviving company (“New DuPont”) on specialty products. In preparation for the spin-offs, DowDuPont held investor days for each of the three new companies on November 8-9, 2018 and sell-side analyst days on February 21, 2019. (Slides and/or webcasts from these events are on DWDP’s investor relations website.) At these meetings, the three companies outlined their strategic visions, reported on recent performance trends and provided performance outlooks. Under CEO Ed Breen’s leadership, a change in the corporate mindset is currently underway. Prior to the merger, investors viewed DowDuPont as bloated, with high overhead and operating costs that were not in alignment with peers. This produced the subpar shareholder returns that became the catalyst for the merger that created DowDuPont. Today, DowDuPont’s main objective is to increase long-term shareholder value by improving return on invested capital. A key part of this effort is reducing costs, for example by eliminating layers of management in its key businesses. The company is utilizing industry benchmarking more extensively to guide its cost-cutting efforts. It is also seeking opportunities to cut overhead without crimping growth. Management is likewise narrowing the scope of its capital spending to focus on projects with high short-term payback potential. It is striving to keep capital spending within depreciation and amortization expense. That should ensure that a higher proportion of reported earnings is converted into cash. The New Dow will hold DowDuPont’s materials sciences businesses, which include the existing Performance Materials & Coatings, Industrial Intermediates & Infrastructure, and Packaging & Specialty Plastics business segments. Detailed descriptions of these businesses are available in DWDP’s 2018 10-K and in the SEC Form 10 describing in detail the proposed separation of new Dow. These are global businesses that utilize ethylene, propylene and silicones (among others) as their primary building blocks. Coatings materials enhance the performance of paints and other coatings. Acrylics are used (in Performance Monomers) in the production of coatings, textiles and personal care products. Dow is the world’s largest producer of purified ethylene oxide used to facilitate and improve the manufacturing processes of a wide variety of consumer and industrial goods. It is the world’s largest producer of polyurethanes that are used to make all rigid, semi-rigid and flexible foams and in the production of coatings, adhesives, sealants and elastomers. It is also a global leader in the production of plastics with two highly integrated global businesses. 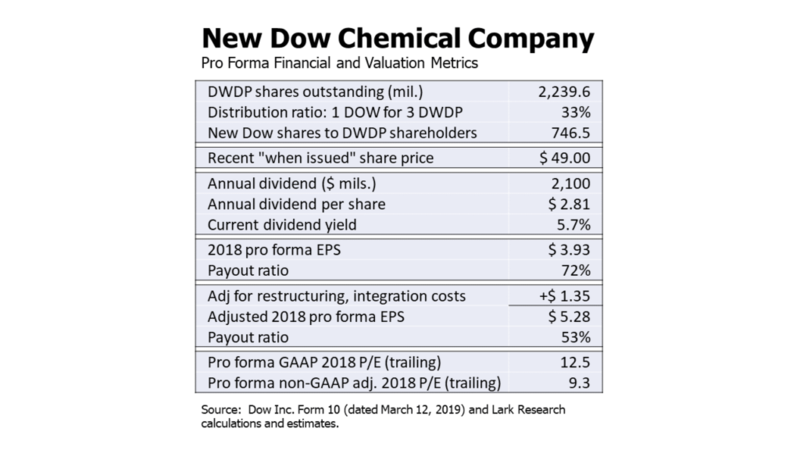 The New Dow has 2018 pro forma net sales of $49.7 billion, operating EBIT of $6.2 billion, and operating EBITDA of $9.1 billion. (Pro forma operating EBIT and EBITDA exclude $1.27 billion of restructuring, integration and separation costs.) At the recent price of $49 for the when-issued stock (currently trading under the symbol “DOWW”), the New Dow has an equity market capitalization of $36.6 billion. Combined with its pro forma debt outstanding of $19.5 billion, its total market capitalization is $56.1 billion. Its current enterprise value-to-EBITDA multiple (excluding the above “one-time” costs) is 6.2 times. The New Dow has announced that it will pay an annual dividend of $2.1 billion. With estimated total shares outstanding of 746.5 million, that works out to $2.81 per share. At the recent “when-issued” price of $49 per share, the stock’s dividend yield is 5.7%, well above the current indicated yield on the S&P 500 of 2.0% and on its peer group average of 3.4%. With pro forma GAAP EPS of $3.93, the $2.81 annual dividend represents a payout ratio of 72%, which seems high. However, the GAAP EPS figure includes an estimated $1.35 of restructuring, integration and separation costs, which presumably will go away eventually. On an adjusted (non-GAAP) basis, which excludes these costs, Dow’s pro forma payout ratio would be a more sustainable 53%. Even without considering the eventual elimination of these one-time costs, New Dow’s proposed dividend may be sustainable. Dow reported 2018 capital expenditures (without pro forma adjustments) of $2.5 billion, down from $3.1 billion in 2017 and $3.8 billion in 2016. 2018 capital expenditures were below pro forma annual depreciation and amortization expense of $2.9 billion (which included $469 million of amortization of intangibles). This appears to be consistent with management’s stated goal of emphasizing smaller capital projects with quicker paybacks. If so (and presuming that the company had not been simply just delaying necessary upgrades), then even the higher dividend payout ratio would be sustainable. At the pro forma GAAP EPS of $3.93, the new Dow is trading at an implied trailing EPS multiple of 12.5 times, which is roughly in line with the current peer group average of 12.2 times. (My peer group includes BASF, Celanese, Eastman, Huntsman and Olin.) On adjusted (non-GAAP) EPS of $5.28, which excludes restructuring, integration and separation costs, Dow is trading at a trailing EPS multiple of 9.5 times. Given its superior dividend yield and the upside earnings potential just from the eventual elimination of one-time costs, New Dow looks attractive at the current quote. Shares will begin trading regular way under the symbol “DOW” on April 2. © Lark Research. All rights reserved. Reproduction without permission is prohibited. This entry was posted in DOW, DWDP, Materials and tagged Dow Inc., DowDuPont. Bookmark the permalink.